​The MELT Method® (MELT) is a simple self-treatment technique used to reduce chronic pain and keep you healthy and active throughout your life. MELT offers natural pain relief and optimal mind-body connection by balancing your nervous system and maintaining healthy connective tissue. Working to simultaneously improve these two systems in your body – the nervous system and connective tissue – MELT is able to address the true cause of pain, not just mask it! Over time, MELT improves your body’s ability to heal and repair itself. It creates long-lasting changes to your body that can feel great and are truly remarkable. MELT is for everyone! It’s a great choice for younger adults and athletes who want to achieve optimal health and performance in ways that don’t create debilitating wear and tear on the body over time. It’s also for people of all ages living with pain or an illness. Easy to learn and quick to yield noticeable results, MELT tends to make people more active. It’s simply more fun to move when you have more energy and less pain! It’s a fabulous addition to your wellness routine. Interested in the 4 week series? Let me know what day and time is good for you. This is a great introduction to the MELT Method. Learn simple techniques done with small rubber balls that will make your whole body feel better. Just by treating the hands and feet, you can begin to see a difference in the way your body feels and functions. This class is adaptable for everyone, can be done seated or standing. These classes are a great way to deepen your MELT practice they offer a sampling of self-treatment techniques using a MELT soft foam roller and the MELT Hand & Foot Treatment Balls. Classes are good for anyone who has completed a MELT Intro workshop or hand & foot 4 week series. These classes cater to the needs of the students in the room and are different each time. These classes will help you refine your MELT techniques and help you work on creating the best MELT maps for your At-Home practice. For best, long lasting results, MELT at least 3 days per week at home for at least 10-15 minutes. *Pre-requisite must attend a MELT Hand & Foot 4 week series or MELT Intro class first. MELT has helped my whole body. I have arthritis and my hands and feet were the most compromised. 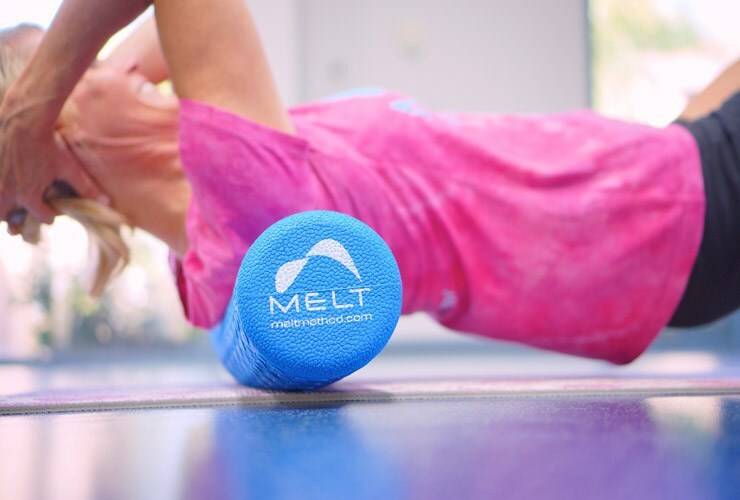 MELT helps the strength of my grip and use of my fingers. It also helps with the pain in my feet and hammer toe and bunion. In the winter, I felt like the medication I took for the arthritis was not effective anymore and when I did MELT, I didn't even need as much medication. I am so happy to have found the miracle that the little blue balls offer. Thank you, Michelle, for changing my life! MELT is awesome! Normally on a day that’s cold and cloudy my fibromyalgia pain is at a 9 on a scale of 1-10. With MELT it’s at a 1. I’m sleeping better too. ​A year ago I suffered a stress fracture in my right foot around the ankle area. I wore a boot for six weeks, rested, stopped going for walks and followed by doctor's advice. Even though an X-ray showed that the foot was healing, I still had pain in my foot when I walked too much or stayed on my feet for too long. Needless to say, my exercise program suffered. I even had to be careful with certain yoga poses or my foot would ache and I would have a setback. Last fall, I took the Melt classes from Michelle. I was skeptical at first that using a little ball in certain exercises would help, but I decided to give it a try because what did I have to lose? After a couple of weeks of daily practice with the Melt exercises, I couldn't believe it. The pain had stopped and I was able to flex my foot and, more importantly, go for daily walks without a reoccurrence of the pain. I am sold on the program. It even helped reduce the inflammation (swelling) on my right hand (my dominant hand) after a long afternoon or evening of hand quilting. It is wonderful to be pain free.